Road to Nowhere...: Lhasa / Kathmandu - 15th Day - Kathmandu! Everything comes to an end...even the greatest experiences must come to an end…but it was with a deep feeling of completion, achievement and satisfaction that I finally made the last kilometers to Kathmandu. 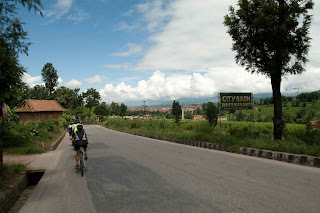 Despite the pollution and the noise, the 15th day was the easiest day of the journey…cycling 32 km from Dhulikhel to Kath was more like a “walk in the park”. Only one or two hours were between me and Kathmandu, however I had already begun my “recovery program”. The company that arranged the bike tour to the group I met on the way (Makalu, Co.) invited me to stay in the same Hotel they stayed….and I must say, this could not have been better! The Hotel was really nice! 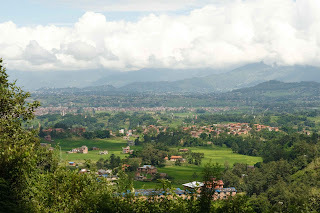 With excellent facilities, a great view over the Himalayas and with a cuisine that could put anyone into ecstasy J. And, at last, the most important, I had the opportunity to share the last moments of my journey with cheerful friends from Spain, Italy, UK and Germany. I knew that I had to be back from the mountains on the 17th of September. So I decided to stay a few days in Kath to recover myself. On September 5th I caught a Bus to Besi Sahar, the village where the 250km circuit around the Annapurna starts. This time I have two pictures to share and a small movie that was recorded in the very moment I arrived at Thamel, in Kathmandu. És um rapaz cheio de astúcia e de destemidez! Que grande pedalada, desde Lhasa a Kathmandu! Grande viagem por montes e vales!